Carousel Coral: Summer 2014 Favorites. Long time no see my lovelies, I hope you all had an amazing summer! In August I took a long break from blogging mostly because half of the month I was away on vacation, at the beautiful Naxos island, which is amazingly beautiful and dreamy. But it was time to get back into blogging again, and since summer is not completely over yet in Greece, I thought it was a great opportunity to show you all the beauty products I used the most in the summertime. In my opinion this is the best curl cream out there, hands down! I have naturally wavy/curly thin hair, I've tried many curling creams in my life, from salon and drugstore brands but this one is the best I've found for my hairtype. It defines them so well without feeling sticky or weight down my hair, and you cannot beat the price, it costs only 2.5 euros. I've always had a love-hate relantionship with styling products, I've tried so many, from mousses to hair gels and sea salt sprays to try and make my curls look more defined and last for more than a few hours, and none of them could do what this God sent product can do! It creates the most beautiful and texturized curls I've ever seen, especially if I use it with the Sunsilk leave-in cream! I only use a small amount of this paste on really wet hair, if I use a lot my hair's sticky as hell. If you have thin/frizzy curly hair and sea salt sprays do not work on your hair you should definitely try this one, trust me. OK I should be honest with you, but when I first bought this cleansing balm I hated it, I was trying to use it as a one step cleanser whenever my skin was feeling more dry but that didn't work. I decided to give it a second chance now that my skin is oily again and I completely love it, but I always use a seperate cleansing gel afterwards. It saved my skin from all the sunscreen that I was using this summer, I've never felt my skin more clean than when I started using this balm, it does an amazing job at removing heavy make up and waterproof sunscreens. Bronzer of my choice for this summer was this amazing limited edition one from Sephora, it's very subtle nothing too much,completely matte and perfect for everyday use. You can see a swatch here. 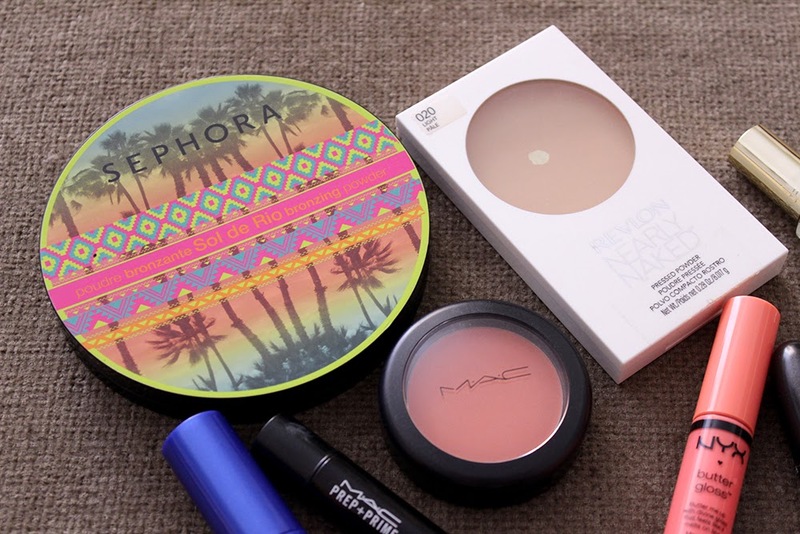 I was very much into powders this summer, sometimes I was just using some concealer and a powder on my face. In my stash I found this one from Revlon which I purchased last year when I visited London, it's a tone darken than my skintone but now that I'm a bit tanned it matches me perfectly. And as you can see I've used a lot of it because I hit pan only after two months of using it. This is the only blush that I've seen using for two months now, it's the perfect true matte peach blush for the summer. If you have warm skintone you have to try it! I love use highlighting pens as undereye concealer when the weather is hot, even though they doesn't cover as well as a regular concealer. This one has a peach shade that neutralizes my dark brown undereye circles, it makes me look more awake and fresh, and that's more than enought for me. I was blown away by this mascara, I never thought that such a cheap mascara would give to my lashes so much curl and length. You can see my full review on it here. I love using peachy glosses at summer, and this one was just perfect because it's super glossy and doesn't have any shimmers in it. 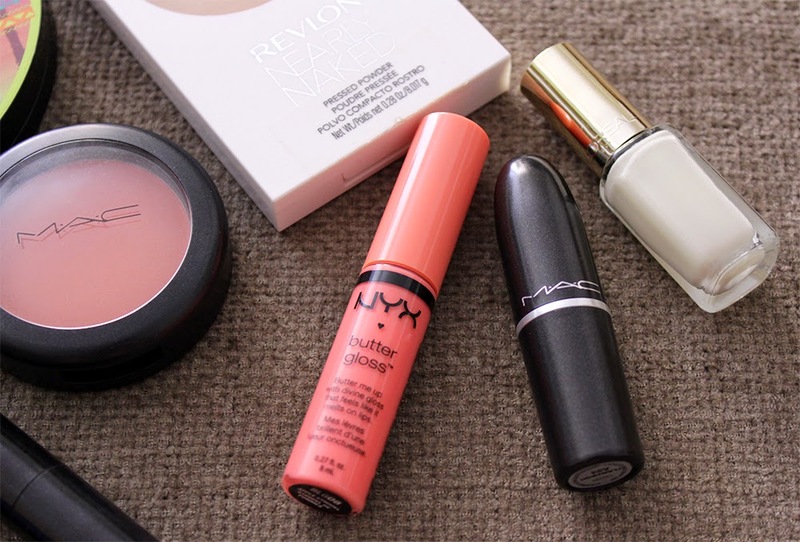 It looks amazing over any peachy and coral lipstick but I loved using it on it's own for a fresh everyday look. I have so many peachy lipsticks, but this summer Flamingo was my number one choice. It's more of a neon coral pink, and it looked amazing even when I wasn't wearing anything else on my face. You can see a swatch here. I never thought I'd say that a pastel nail polish was my top shade for the summer but it's true! I always go for reds and corals but this one changed my mind! It's not the traditional opaque white nail polish, it has a light yellow-lemonish tint into it that makes it special. Also it looks amazing on toes when you're tanned. 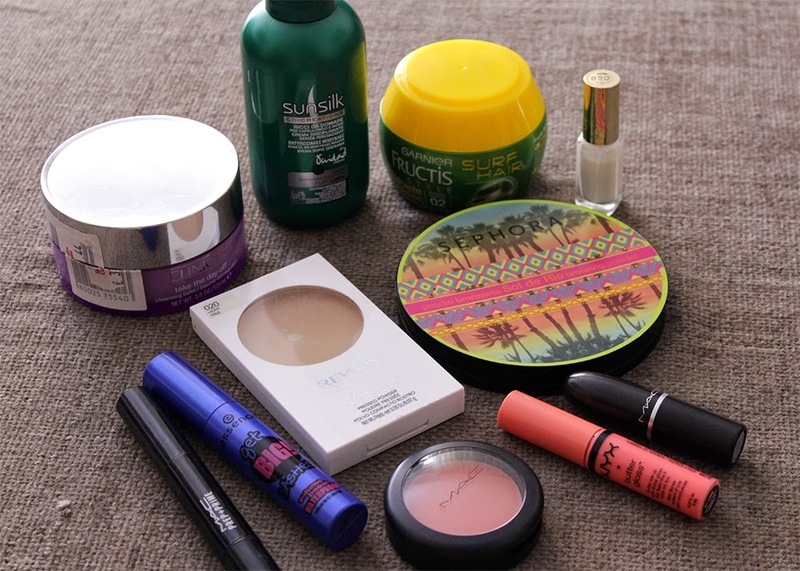 So these were all the beauty products that I loved the most this summer. Have you tried any of those? 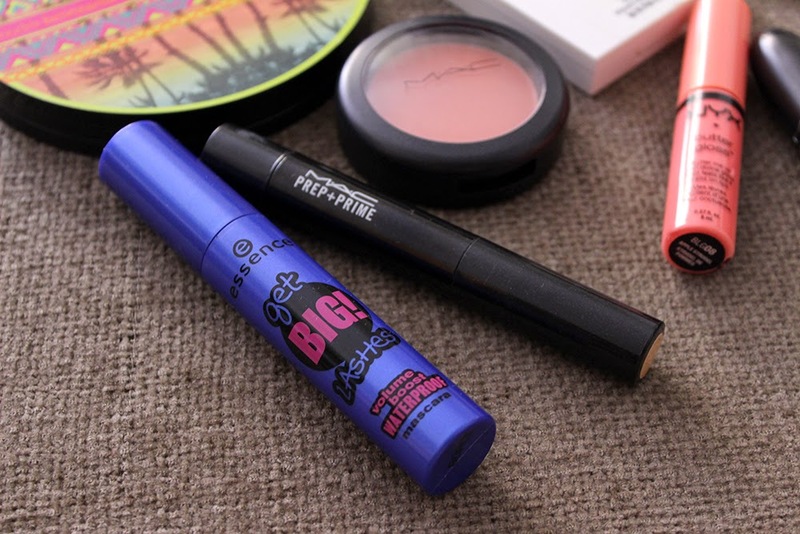 What were your favourite products for the summer? Let me know! YES! You liked the balm!!! I knew it!!! Χαχαχαχα, μου πηρε κανα 8μηνο αλλα εγινε το θαυμα! 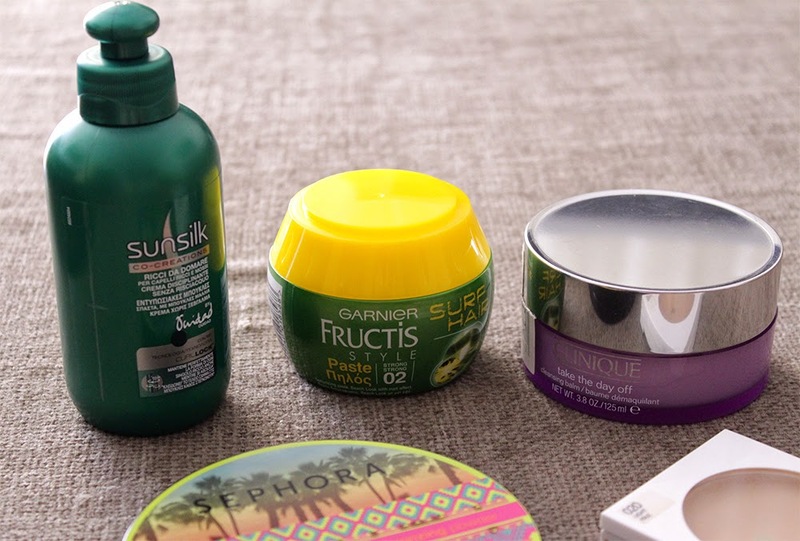 Δοκίμασα το Fructis Surf Hair Paste και μου κόλλησε τελείως τα μαλλιά, μάλλον πρέπει να βάλω ελάχιστη ποσότητα όπως λες! Αφού τελείωσα το μοβ Sunsilk τα πέτυχα στη μισή τιμή οπότε πήρα ξανά και το μοβ και το πράσινο. Το μοβ μου άρεσε γιατί ακόμα και σε στεγνά μαλλιά δε μου τα βάρυνε καθόλου, από ότι λες μάλλον θα αγαπησω και το πράσινο! Nαι θελει λιγη ποσοτητα κ καλο απλωμα, εγω "τσαλακωνω" το hair paste απο κατω προς τα πανω για σχηματισμο κ ογκο για κανα λεπτο για να διανεμηθει παντου ωστε να μην κολλαει. so there was this girl from a SOPHIA SOPHIA account on youtube who recommended the curl lock cream for me. I couldn't identify her because there was no photo. if it was you, THANK YOU, if not..then I totally agree with what you said. IT'S PERFECT ! Hey Christina, I did recommend you the curl lock cream about a year ago in one of your "Collective Haul" videos, I think it was last November, but my account name now is Sophia (because of the Google+), back then it was Sophianna. I'm so glad you loved it, it's one of these products that can be overlooked because of how cheap it is, but it works wonders on curly hair! πολύ όμορφα όλα!!!! τα conditioner της sunsilk είναι υπέροχα!!!! Η αλήθεια είναι πως το brozer των Sephora και μόνο από την συσκευασία θέλεις να το αγοράσεις! Τρομερό! Seventeen The Stylist Mascara Review.